Welcome to my counselor online. I’m Cassie, and this is asking for a friend. That’s where you submit your questions and I tracked down one of our therapists to answer your questions. So today I have Josh with me to answer a question from an anonymous friend in Norway. And the question is this. 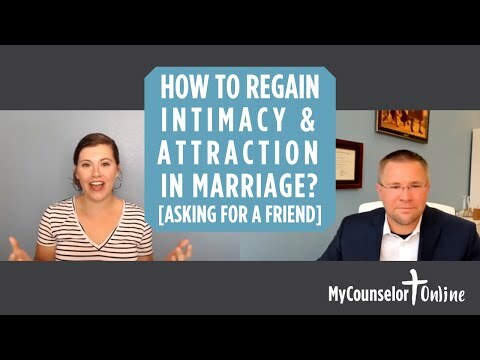 How do you maintain intimacy in marriage when she is not physically attracted to him, or how do you regain that attraction. So thank you for your question, and Josh, thanks for coming in answering this question. Yeah. Good question from anonymous in Norway, a lot of couples can navigate through, you know, what if there’s a diminishing of attraction or just life has happened, and there’s distance and disconnect. We just don’t Find that passion in pursuit and connection that we once did. And how do we regain that can it be regained can we navigate that that would be a common question that a lot of couples have out there so Let’s first answer the question to say that falling out of love, typically is not like falling in a hole in the ground. Then it’s not something that you’re just someone long one day and boom happens as an event. One moment, you’re in love next minute you’re not in love. One minute. You’re attracted and enjoying and passionate about your spouse and next minute you’re not it typically happens over time and through a series of life events that take place. It can be major events, a huge and of crises within the relationship or life that takes place at creates this big disconnect Between individuals because of the trauma that’s happened and at other times it’s the the grind of little things, and that there’s unresolved conflict and there’s a disconnect Communication, or there’s difficulty in their relationship that’s unresolved but leaves unsatisfying in overtime, month after month, year after year. The distances gets broader and broader until we’re no longer passionate or enjoying each other, whichever is the case. The key to restoring that are getting back that places to understand how did we get here to begin with. Know what were the traumas that begin that shift in our life from this person who we were passionate about and who we loved and enjoyed and and vision spending the rest of our life with to somebody that were like or, at worst worse, you know, just not interested in being around at all that we have a kind of more than just distance we have hostility towards And a disdain for, you know, how did we get there, or what were the, the small things that just over time and of war out our affection for each other. We need to understand what those things are. If we’re going to be able to forgive those things. If we’re going to be able to change the dynamics of those things.And put in place things that can reverse that process. And in the same way that it generally isn’t a, a quick sudden something happened. And now we don’t like each other at all anymore. We’d have this disconnect, or we don’t find it to their attractive or enjoy each other. Figuring out what’s getting in the way and troubleshooting that learning the things that we need to do differently in our relationship to foster and cultivate that connection. And practicing those things over time is going to be a process. And so, setting up your expectations on the front end to be realistic is helpful. You know, understand that if you want to rekindle the connection and the affection track attraction, you’re going to have to address the things that are have created the depletion of them. That disconnect, you’re going to have to learn new things to be able to cultivate that. And your relationship and you’re going to have to be patient with the process of doing so.So at a high level. Those are the steps that are a part of Kind of turning the ship around, as it were, in getting heading in a direction in your relationship that can be healthy, be good and be something that you are really excited about being a part of and being engaged him. Well, well, that sounds kind of enormous. I love that there is a strategy and there’s so much hope there’s so much opportunity for that relationship so that’s exciting stuff. So thank you for your time. Josh, and thank you, anonymous friend in Norway for your question. If you have a question, and you’d like to get one of our therapists to answer it. You can submit your question.On are asking for a friend page and I will track down the therapists and we will get your question answered it will post on our Asking for a friend page and also in an upcoming edition of our weekly e newsletter. So check for it there. Asking For A Friend – Ask your question here!